The option to use the SDCard as an extention of the Internal Storage has disappeared from the storage options. There might be a way to get around the first two problems, but I don't really feel like chasing that right now. It turns out that fixing the last case for some of my apps works, but isn't as intuitive as I would like it to be. Here's what to do. 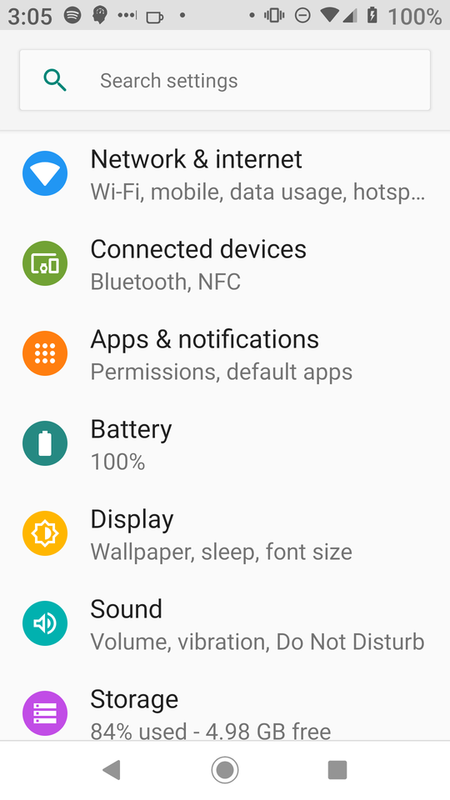 In your Android settings menu pick "Apps & notifications". Next pick Beyond Pod from the list of applications (in this case it was one of my recently opened applications, but it isn't always). 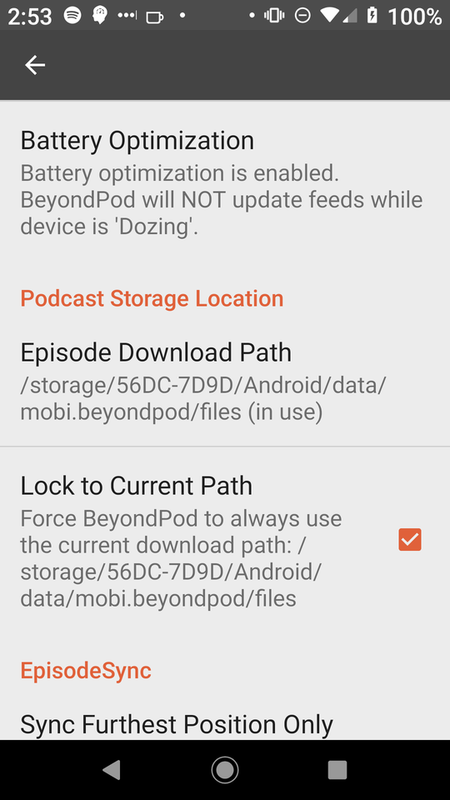 In the BeyondPod settings make sure that Permissions has Storage listed, if not tap the Permissions to get to that setting. 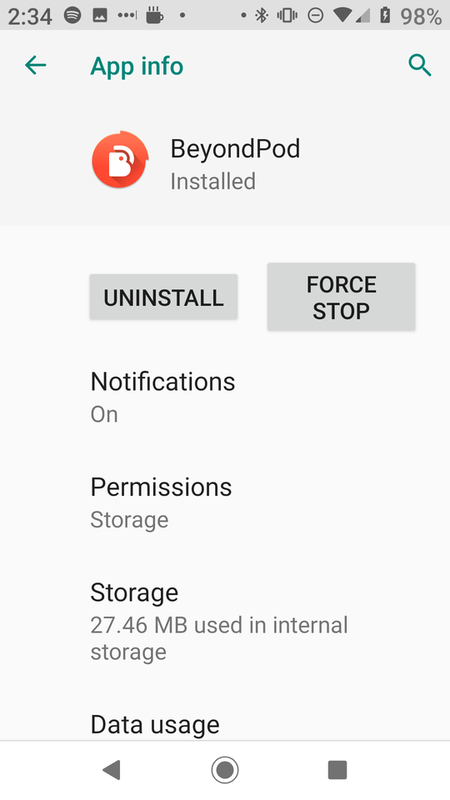 In the "App permissions" make sure the switch next to "Storage" is turned on. 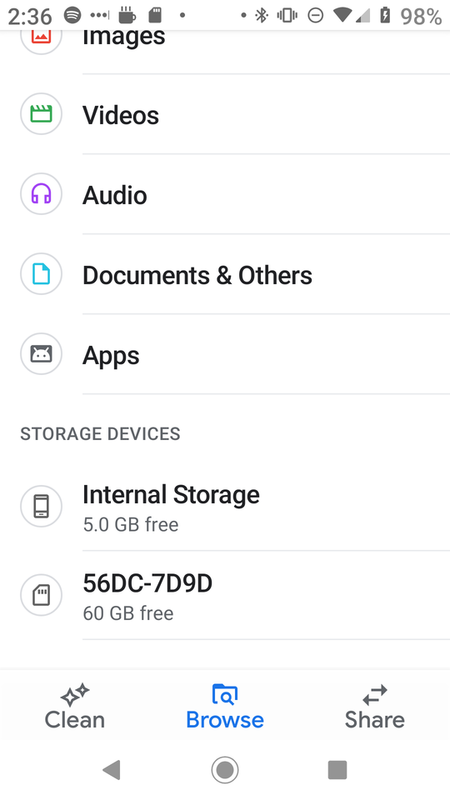 I couldn't any way to find out the path to the sdcard in the Android settings themselves. 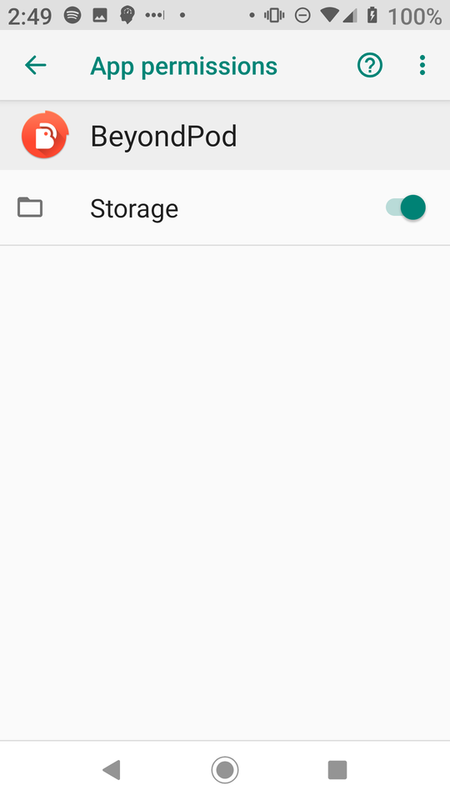 The easiest way (to me) is to set up android debug bridge and then list the contents of the storage folder. 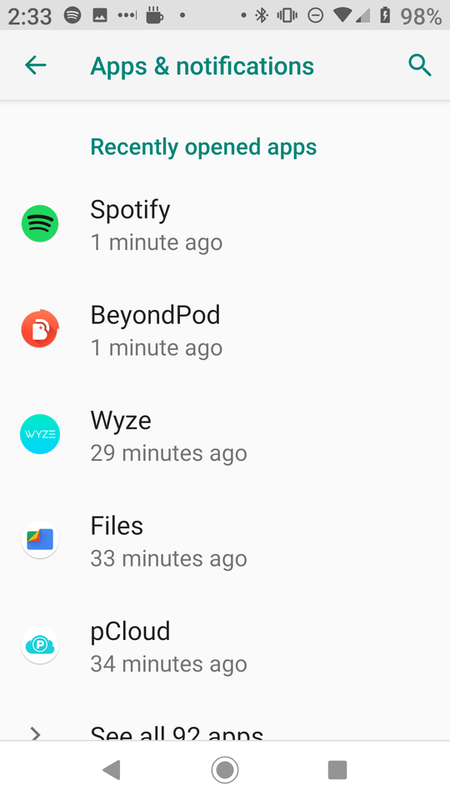 and although there is that Permission denied for the .android_secure file, it let me create folders and files in there so I figured I would create a folder for downloads and point BeyondPod to it. Even though the Settings menus don't seem to show you the path to the sdcard you can use a file browser app if you don't want to use adb. Here's my sdcards name in the files app (it's not a file browser, but it's rather something that's supposed to help you clean up your storage but it works for this case). 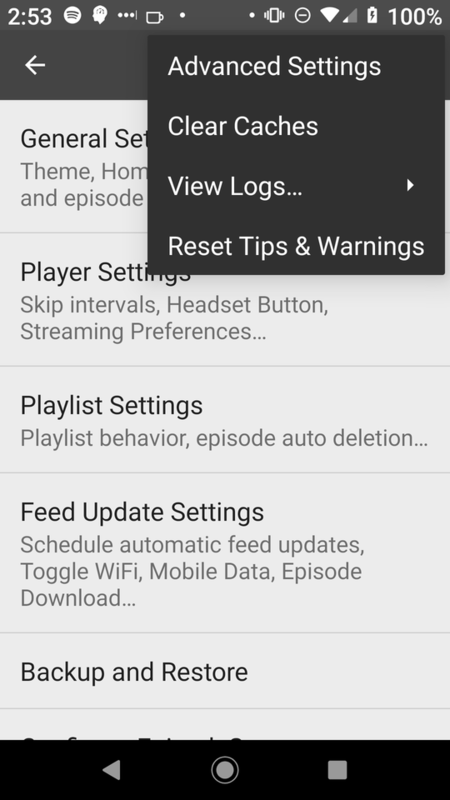 Open Beyond Pod and scroll to the bottom feeds list and tap on the Settings option. Now click on the hamburger menu icon on the top right to open it up and tap on Advanced Settings. 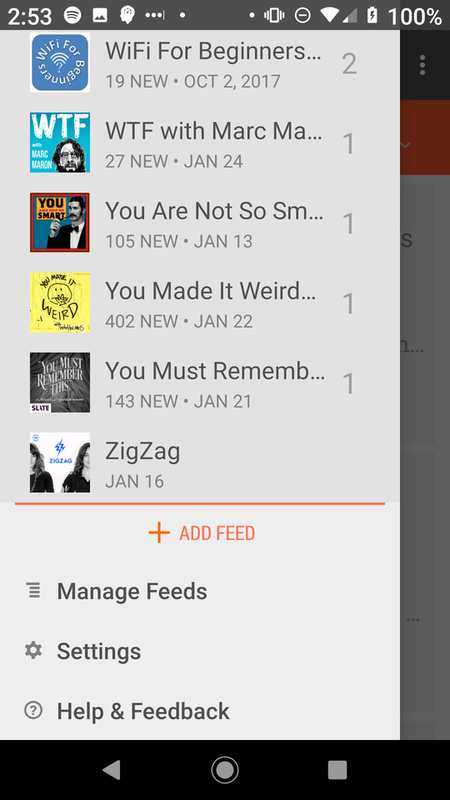 Scroll all the way down until you reach the Podcast Storage Location section and tap on Episode Download Path to enter the folder path. You should probably also click Lock to Current Path as well. Once you change the settings BeyondPod will move the files and restart and at this point it should be storing everything to the SDCard. Now, on to all the other apps in there. datetime is just to show how long things take. In this case the data-set is fairly small so it doesn't take very long, but in other cases it might take a very long time to build the LDA model so I like to time it so I know the next time about how long I should wait. I'm going to use the Twenty Newsgroups data-set, not because of anything significant, but because sklearn has a downloader for it so I figured it'd be easiest. The newsgroups.data is a list, so it doesn't have a shape attribute like it would it it were a numpy array. The documentation for the fetch_20newsgroups function says that the full dataset has 18,000 entries, so we have about 63% of the full set. I'm going to use sklearn's CountVectorizer to convert the newsgroups documents to arrays of token counts. This is about the visualization, not making an accurate model so I'm going to use the built-in tokenizer. I'm not sure what the fit method is for, but the fit_transform method returns the document-term matrix that we need (each row represents a document, the columns are the tokens, and the cells hold the counts for each token in the document). Now we'll build the Latent Dirichlet Allocation Model. Okay so here's where we try and get pyLDAvis into this thing. The first step in using pyLDAvis is to create a PreparedData named-tuple using the prepare function. Now I'm going to save the html to a file so we can load it later. So here's where we create the HTML that will be embedded in this post. The JQuery load function puts the content of our saved file into the div. I added the css call because I have my site's font-size set to extra-large, since the Goudy Bookstyle looks too small to me otherwise (I think nice fonts look better when they're big), which causes the buttons in the pyLDAvis widget to overflow out of the header. Under normal circumstances you wouldn't need to do this, but if you do want to do any one-off styling, here's an example of how to do it. Otherwise maybe an update to the style-sheet would be better. The right-hand box is still messed up, but it's good enough for this example. I'm going to use sklearn's CountVectorizer to convert the newsgroups to convert the documents to arrays of token counts. This is about the visualization, not making an accurate model so I'm going to use the built-in tokenizer. I'm not sure what the fit method is for, but the fit_transform method returns the document-term matrix that we need (each row represents a document, the columns are the tokens, and the cells hold the counts for each token in the document). That was pretty fast, I guess this data set is sort of small. The HTML that creates the plot is fairly large. The browser seems to handle it okay, but emacs gets noticeably slower. I'll try the simple template to see if that makes any difference (the default works in both jupyter notebooks and any other HTML, but simple won't work in jupyter notebooks). I'm also going to set the ID because the CSS doesn't work so well with mine so I'm going to try and override the font-size on the header. This should be paper-based, or at least something that's always there and quick to use. The original system was a wooden box with A6 paper. I'm using a static site with plain text (org-mode). The system is aimed at writers, but I'm a computer programmer, and I think it might work with other types of output (like drawing) so it's really just having a way to produce something from your project. This is my re-wording of the Slip Box Method. Write everything down - ideas don't count until they're out of your head and on paper. Writing it down also frees your mind to move on to other things. Whenever you are taking in someone else's ideas (e.g. reading, listening) take notes. They are complete - write them for your future self, don't rely on being able to remember what else is needed to understand the note. They are written in a way that relates to your interests. There is only one idea per note. When you file your note look through the other notes and try and place it behind a related note. Add links to other notes that are related. Add the new note to an entry-point note that holds links to other notes. Don't try and come up with a project by "thinking", look through the slip box and let it tell you what you're interested in. If you have an idea for what to do but there isn't enough in the box yet, take more notes. Keep the notes in one folder - don't sort them into sub-categories. This way you can make new associations that you didn't have when you first made the note. Copy everything that seems relevant to a project folder on your desktop and see what needs to be filled in and what seems redundant (or maybe just wrong). Take these fragmented notes and convert them into a coherent argument. If you can't then look to take more notes to fill in what's missing. Don't accept the first draft, edit, erase, re-do. When you're done with the project, start over with a new one. The original method used paper and a wooden box. I really like paper and am tempted to try this, but I don't think doing something that makes me even more if a pack-rat is a good idea. The book (How To Take Smart Notes) recommends a computer program written specifically for this system, but I am a little leery of getting tied into one program, and all these GUI programs are starting to turn me off. Flattening out the file-system makes it hard to browse the files, though. I guess less and ls are going to be the main thing I use (and maybe ag and deft). We'll see, I only started reading the book yesterday so I'm still trying to figure this out as I go. This book describes the Slip-Box method developed by Niklas Luhmann. Its focus is on research writing, but seems like a good system for projects in general. It points that people are generally taught that you should work in a series of "next-steps", but if you are doing something creative (or at least something you haven't done before) then this is an impractical, if not impossible, way to work. Instead the author proposes that you use a system of note-taking to capture everything and then look for patterns in your notes - a bottoms-up approach rather than a top-down one. [HTTSN] Ahrens S. How to take smart notes: one simple technique to boost writing, learning and thinking: for students, academics and nonfiction book writers. North Charleston, SC: CreateSpace; 2017. 170 p.
This is one way to encrypt the contents for cloud-synchronized folders using CryFS. I'm going to illustrate it using the Dropbox folder that the dropbox client creates. Ubuntu currently (November 10, 2018) has CryFS as part of its packages so you can install it with apt. The cryfs command will create the two folders and set them up for you. The syntax is cryfs <target> <source>. The target will contain the encrypted folders so it will go in the Dropbox folder, while the source will hold the unencrypted files. This is the same command you would use on another computer to set-up the existing encrypted folder on your new computer. The source folder can be named differently, but the target folder and the password need to be the same one you used when you created it. If you need to unmount it you can use fusermount. Since you are doing all this within your home directory you don't need root privileges (except to install cryfs with apt). I got this from Linux Babe. But the CryFS Tutorial is pretty straight-forward, just skips the part about install cryfs. """count tokens in the line"""